A Star Is Born, Bohemian Rhapsody, and more! (SPOT.ph) Busy trying to find your next Halloween costume? Take a break or maybe even take inspiration from the new movies that are hitting screens this October. This month, see Lady Gaga and Bradley Cooper fall in love, expose the horrors of a cult with Netflix, and watch Tom Hardy transform into Venom. Pencil down these release dates, Spotters! You’re in for a good time this October. If all the recently released rom-coms have got you feeling bitter, then Destination Wedding is the cynical romance for you. Lindsay (Winona Ryder) and Frank (Keanu Reeves) are two strangers who meet while on the way to a destination wedding. They soon discover that they have a lot more in common than they realize: They hate the newlyweds, themselves, and each other. 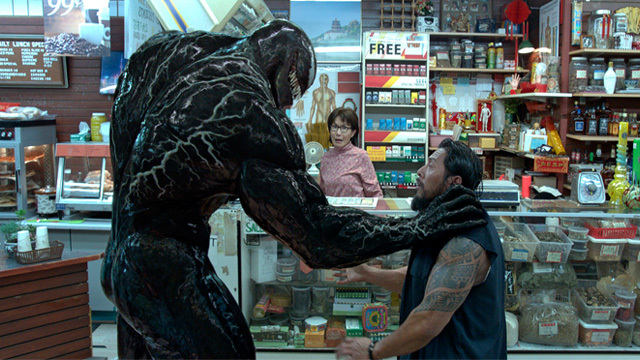 Forget what you know of Venom from Spider-Man 3. Director Ruben Fleischer’s new movie stars Tom Hardy as Eddie Brock, a journalist investigating a mysterious organization called Life Foundation. While there, he accidentally comes into contact with an alien symbiote that gives him superhuman abilities and a terrifying alter-ego. The film also features an all-star cast that includes Riz Ahmed, Michelle Williams, Jenny Slate, and Woody Harrelson. After a successful premiere at the Venice Film Festival, Bradley Cooper’s directorial debut is a remake of the 1937 film of the same name. Cooper plays a veteran musician named Jackson, who discovers and later, falls in love with a struggling musician named Ally (Lady Gaga). But as her career suddenly skyrockets, their relationship starts to fall apart. Netflix’s latest horror film stars Downton Abbey’s Dan Stevens as Thomas, who travels to a remote island after a mysterious religious cult kidnaps his sister. His search for the truth leads him to dig deeper and deeper into the cult’s sinister secrets. Apostle is directed by Gareth Evans, who famously helmed The Raid franchise, so you’re guaranteed a wild ride with this movie. Oscar-winning director Damien Chazelle reteams with his La La Land star Ryan Gosling in this depiction of NASA’s mission to land a man on the moon. Gosling plays Neil Armstrong, alongside the likes of The Crown’s Claire Foy, Kyle Chandler, Corey Stoll, and more. Director Paul Soriano returns to the silver screen with Bea Alonzo and Aga Muhlach in tow. Alonzo plays a woman who impulsively gets into a relationship after learning she could die any time because of her heart condition. This live-action adaptation of a Japanese film is set in 2029, where North and South Korea are finally ready to have a unified government. In the midst of preparations, South Korean police launch a special unit called “Illang” in order to stop a terrorist group who’ll do anything to undo their years of effort. The film starts streaming on Netflix on October 19. Although this 2018 movie is the 11th installment in the franchise, it’s also a direct sequel to the 1978 original. Jamie Lee Curtis reprises her role as Laurie Strode, the sole survivor of Michael Meyers’ killing spree. Now suffering from post-traumatic stress disorder, she comes face-to-face with him for a final showdown on Halloween. The popular ballet is now a Disney movie! It centers on a young girl named Clara (Mackenzie Foy), who is transported into a strange and magical parallel world, and is tasked to restore harmony in the land. The rest of the cast includes Keira Knightley, Morgan Freeman, Helen Mirren, and more. Mr. Robot star Rami Malek brings the extraordinary Freddie Mercury to life in this biopic directed by Bryan Singer. The film follows the meteoric rise of Queen through the years, and the tumultuous life of its lead singer.